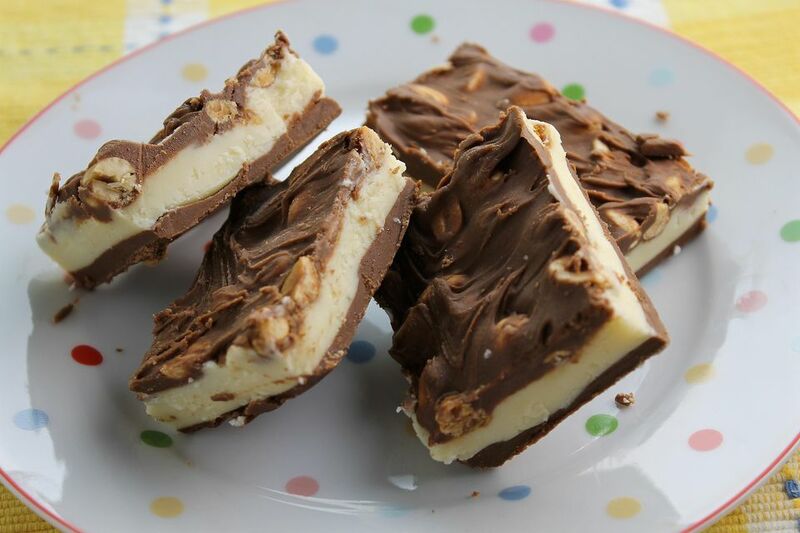 This delicious recipe for Nut Goody Bars is so fabulous. If you like the candy made from chocolate, nougat and lots of peanuts, you'll swoon over these bars. Be sure to cut the bars into small squares, because it's so rich. This recipe makes a huge pan of candies, which freeze well too, so share them with your family and friends. Keep the bars in the fridge; if left at room temperature, they may become too soft to cut into squares. About the powdered sugar: I find it easier to buy a two-pound bag of powdered sugar rather than measure out the 7-1/2 cups; use the whole thing. It's a more accurate measure, too. 1. Butter a 15x10" jelly roll pan and set aside. 2. In a large saucepan, melt chocolate chips and butterscotch chips until smooth, stirring frequently. Remove from heat and add peanut butter, stirring until mixture is melted and smooth. 3. Spread half of this melted chocolate mixture into the prepared pan and refrigerate. 4. Stir peanuts into remaining chocolate mixture in saucepan and set aside. 5. In another large heavy saucepan, combine butter and light cream over medium heat, stirring until melted. 6. Stir in the pudding mix (make sure it's not instant pudding, but the kind that's cooked) and stir over medium heat until mixture thickens slightly. Do not let the mixture come to a boil. 7. Remove pan from heat and beat in powdered sugar, using a mixer. Then add vanilla and blend. 8. Let this mixture cool for 15 minutes. 9. Then spread pudding mixture over the solidified chocolate mixture in the jelly roll pan. I like to drop it onto the chocolate layer by small spoonfuls, then spread it gently using an offset spatula. 10. Chill the chocolate and pudding layers for 30-40 minutes until firm. then drop reserved chocolate and peanut mixture over pudding layer with a spoon and spread gently to cover. 11. Chill bars until firm, about 2 hours, then cut into bars. Store in refrigerator. NOTE: Be sure to use the full 7-1/2 cups powdered sugar in the filling. That's a lot, but it's necessary so the filling sets. And make sure that you use a COOKED vanilla pudding mix, not the instant type - that will make the recipe fail.